I've been a little out of focus lately--not hiking the normal number of daily miles. The excuses have varied, but on these two days it was the weather - rain here and all-time record breaking snow in my former home town of Eldersburg, MD. They were both caused by the same system. Friday it rained here. Friday night and Saturday morning the blizzard in Maryland was such an extreme event that I wanted to follow it closely, so I got a motel room and watched TV much of Friday night and Saturday morning rather than hiking. Nobody was getting much hiking done in Maryland on Saturday either. Baltimore's official snow accumulation of nearly 30 inches was an all time single storm record. And perhaps because of the rain the red lichens (Cryptothecia rubrocincta) were practically glowing on this small cypress that they had heavily inhabited. Otherwise it was arrow-straight trail for mile after mile--grassy surface underlain by railroad gravel. In the town of Hampton, people had used part of the trail as a dump--it was pretty unsightly. 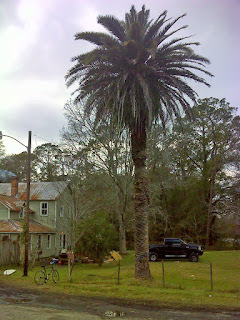 But amidst the spoilage I saw an old house with a huge feather-leaf palm in its yard. Was this house beside the railroad track once an inn? Is the tree a Canary Island Date Palm? I cannot be certain. All I know is that I was in awe. I'm a sucker for those specimen trees. This one reminded me of something I might see in front of a 400 year old Spanish mission somewhere in the Caribbean, so suddenly the Hampton trash didn't matter any more. Here's the map of these two short days of hiking, with links to a few more photos.